UK: Construction work has started on the onshore cable routes for the 860MW Triton Knoll wind farm to be built off England's east coast. 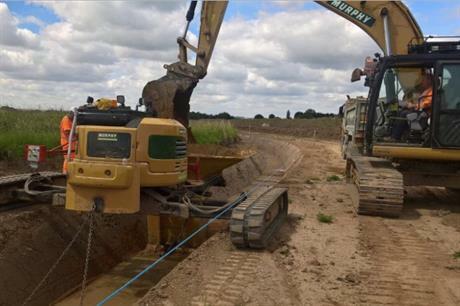 J Murphy & Sons began construction by cutting the turf on the 60-km cable route between the point of landfall near Anderby Creek in Lincolnshire and a new substation to be built at Bicker Fen on 10 September. Work on the new onshore substation will start early in 2019, when Siemens Transmission and Distrubution is due to build a new facility close to the existing electrical substation near Bicker. Construction and engineering company J Murphy & Sons described installation of the electrical system as "one of the biggest engineering challenges of its kind" and added that installing the underground cables will require using horizontal drills to overcome more than 300 obstacles. This is believed to be three times more than the previous record for UK infrastructure. Initial works to prepare for onshore construction had started in June 2018 and included installing temporary offices, preparing access roads, and stripping topsoil along the cable route. The construction and engineering firm had also started recruiting UK-based suppliers. Innogy secured support for Triton Knoll in the UK’s contract for difference (CfD) auction in September and will comprise 90 of MHI Vestas’ V164-9.5 turbines. It is due online in 2021/22. The developer achieved financial close on the project at the end of August 2018, after Japanese utilities J-Power (25%) and Kansai Electric Power (16%) acquired stakes in the project. Innogy owns the 59% majority stake in Triton Knoll.